Am running this week's blogging marathon with Make them as cakes as theme, after two delicious cake, my today's post is going to an another interesting cake which is prepared with whole wheat flour and kiwi. If you are a lover of spongy cake with fruits, this cake is a must to try which is completely butter free. However i opted for eggs, but you still bake this cake as eggless by replacing eggs with condensed milk. A prefect evening time snack cake, and this cake is one of the best way to sneak kiwi in your diet as well. We enjoyed this cake thoroughly, especially i loved this cake as kiwi brings a nice flavor and texture to this cake while having this cake. Melt the brown sugar with enough water and heat in simmer until the sugar gets dissolves. Pour this sugar syrup to a 8inch round baking pan. Now arrange the sliced kiwi chunks over the sugar syrup and keep aside. Beat the sugar, eggs until everything turns soft. Finally add the yogurt,oil beat everything for few more minutes. Meanwhile sift the flours,baking soda and baking powder, keep aside. Add the sifted flours, vanilla essence to the wet ingredients, mix everything well with a spatula until everything get well mixed, dont over mix..
Pour the cake batter to the already prepared pan and bake in middle rack for 25-30minutes or until the skewers insert come out clean..
Invert the baking pan over a plate and slice the cake as you desire, enjoy with ur cup of tea. With the kiwi all over the cake, it looks beautiful Priya. And dish made with farm fresh fruits turn fantastic. You are so lucky to have those fresh fruits. 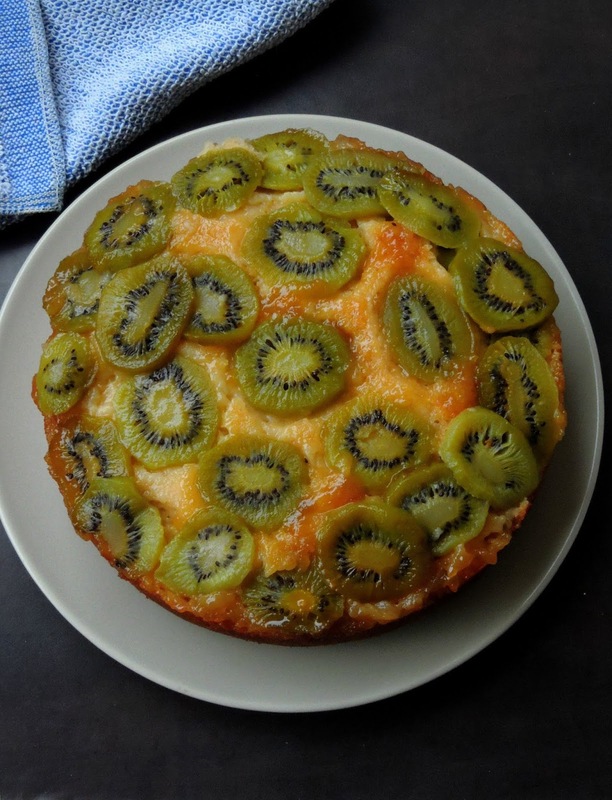 Kiwi Upside Down Cake looks delectable. Fresh fruits add aswome flavour to cakes always. This has turned super moist. Upside down cakes are such fun to bake, especially the moment when you flip them out. With kiwi is a totally new flavour for me. I love kiwi so I know I'll love this cake too. What a wonderful fruity cake. I love kiwi but am wondering how cooked ones would taste as I've never tried them. Wow!! The kiwi upside cake looks absolutely delightful & beautiful. Even I love to used fresh flavourful fruits in my baking. Now this one is the next one. Cake looks so soft and moist. My kids love kiwi, I have used it on fruits cakes and puddings but never upside down way!! Very nice idea, will surely try this. Thanks for sharing!!! Oh, I can imagine that tangy taste with sweet cake, gosh I am drooling! Perfectly baked cake is moist and fluffy. Wish I could grab a slice!! The kiwi studded upside down cake looks fantastic. I must try this sometime. 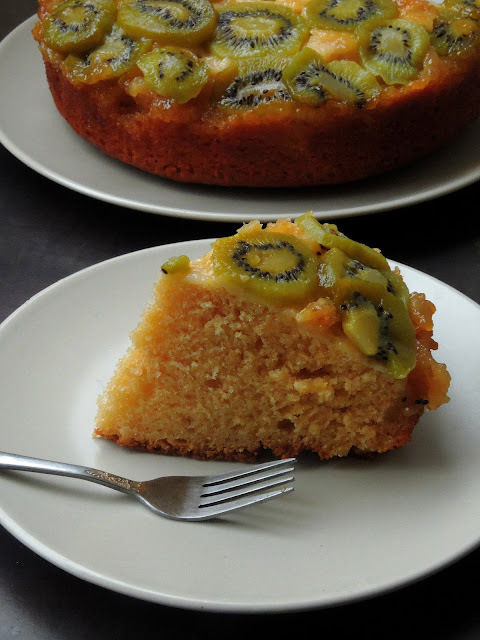 Upside down cake with kiwi looks so gorgeous and moist .Thanks for this lovely share. 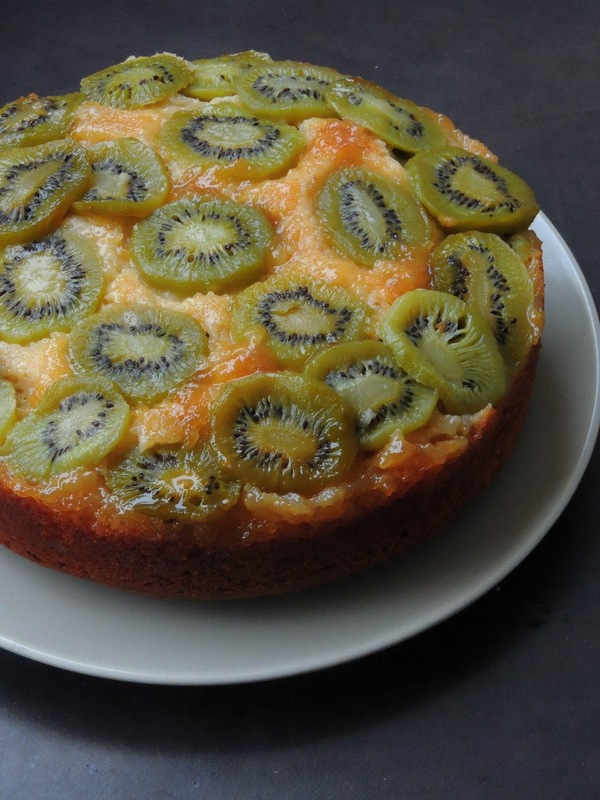 I love upside down cake's and this kiwi version looks so fantastic! 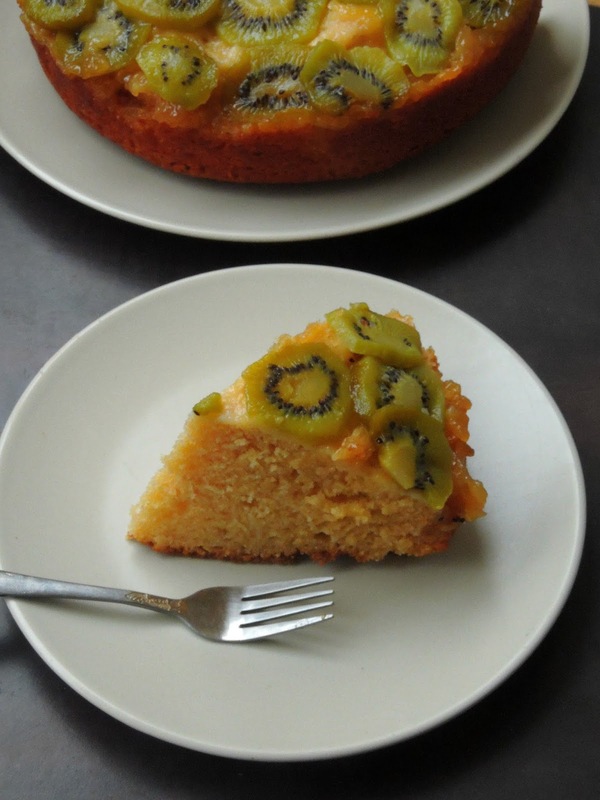 I have been thinking for a long time to try an upside down cake and using kiwi is such a brilliant idea. Love the beautiful cake!